Bare 20 and Bare 40 Urea Gels are formulated for everyday rough, dry, cracked, calloused, and damaged skin. 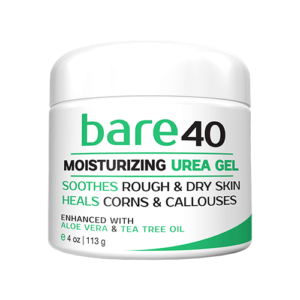 Using two strengths of Urea, Bare Urea Gel gives you a deep moisturizing feel all day, everyday. 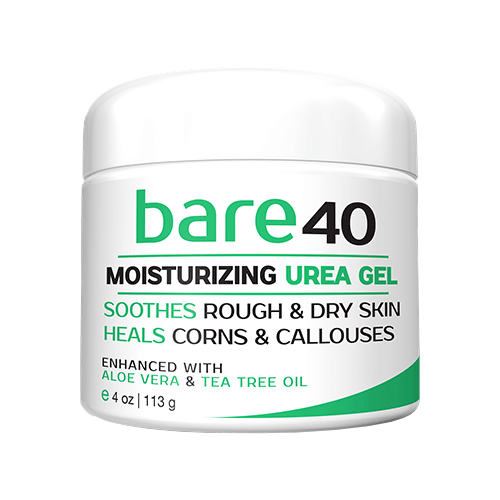 BARE 20 is a Urea topical gel. It’s a professionally formulated ex-foliating gel designed to help soften and remove rough, scaly skin caused by warts, calluses, keratosis or psoriasis. It is a concentrated and highly effective anti-fungal foot gel that re-hydrates the skin to a healthy appearance; a softer, smoother and more ravishing skin surface. The fast absorbing gel provides grease-less, non-staining, non-irritating, soothing and moisturizing relief from redness, itching and scaling. FEATURES UREA: Urea is used to treat dry/rough skin conditions (e.g., eczema, psoriasis, corns, callouses). Urea is known as a keratolytic. It increases moisture in the skin by softening/dissolving the horny substance (keratin) holding the top layer of skin cells together. This effect helps the dead skin cells fall off and helps the skin keep more water in. PROTECT AND HYDRATE YOUR SKIN: Urea 20 has 20% Urea providing a deeply moisturizing and ex-foliating experience for your skin for complete hydration. PROTECT AND HYDRATE YOUR SKIN: Urea 40 has 40% Urea providing a deeply moisturizing and ex-foliating experience for your skin for complete hydration. 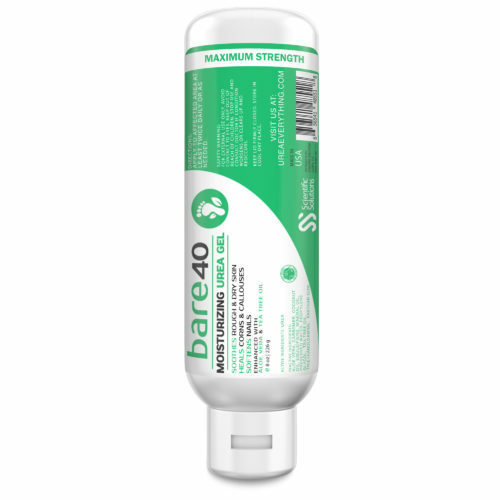 Bare 40 is a Urea topical gel with the maximum strength of urea allowed in an OTC product. It’s a professionally formulated exfoliating gel-cream designed to help soften and remove rough, scaly skin caused by warts, callouses, keratosis or psoriasis. It is a concentrated and highly effective antifungal foot cream that re-hydrates the skin to a healthy appearance; a softer, smoother and more ravishing skin surface. 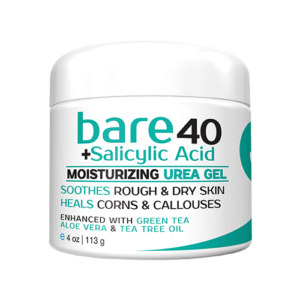 With 40% Urea concentration BARE 40 Moisturizing Urea Gel is specially formulated to remove thick, calloused areas while re-hydrating skin to a healthy appearance, a softer, smoother and more ravishing skin surface. It is fast absorbing provides greaseless soothing relief. 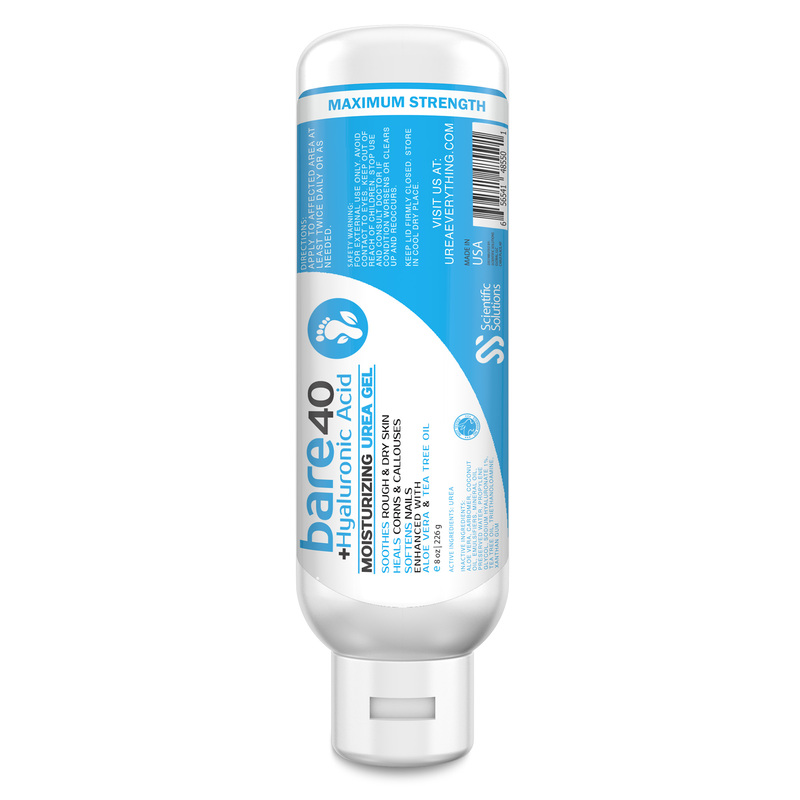 Bare 40 Plus Hyaluronic Acid and Bare 40 Plus Salicylic Acid Urea Gels are formulated for severe skin conditions such as severe corns, callouses, dermatitis, psoriasis, and keratosis. With everyday use, experience the ultimate moisturizing power of Bare. 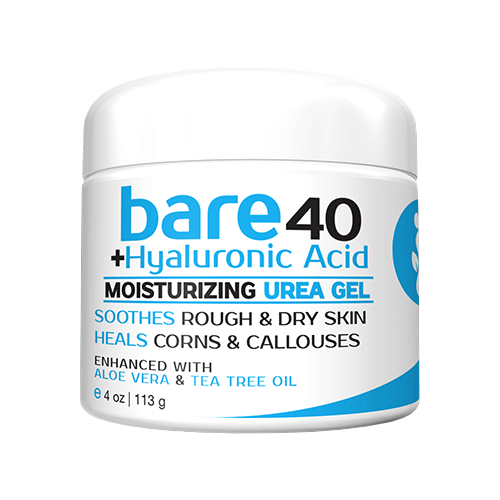 Bare 40 Plus Hyaluronic Acid combines Hyaluronic Acid and Urea topical gel. The Hyaluronic Acid helps reduce water loss in the skin while also reducing the appearance of wrinkles by re-hydrating your skin. 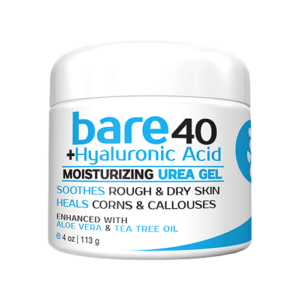 Bare Urea Gel Plus Hyaluronic Acid will help smooth away rough skin while drenching dry skin with unbelievable moisture. FEATURES HYALURONIC ACID: Hyaluronic Acid replenishes the moisture in your skin by drawing in water molecules from the air, creating skin that is super-hydrated. Hyaluronic Acid provides continuous moisture to the skin by binding up to 1000 times its weight in water. Young skin is smooth and elastic and contains large amounts of Hyaluronic Acid that helps keep the skin to stay young and healthy. With age, the ability of the skin to produce Hyaluronic Acid decreases. Replenish the Hyaluronic Acid in your skin with Bare. PROTECT AND HYDRATE YOUR SKIN: Urea 40 Plus combines Urea and .01% Hyaluronic Acid providing a deeply moisturizing experience for your skin for complete hydration. 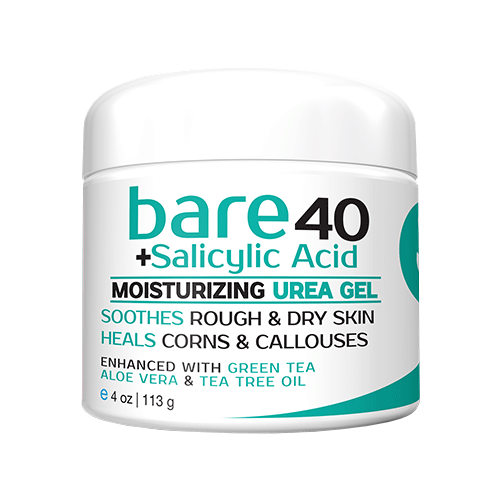 BARE 40 Plus Salicylic Acid combines Salicylic Acid and Urea topical gel. For most skin types, Salicylic Acid exfoliation is one of the best exfoliating treatments available. Salicylic Acid exfoliation is a great way to soothe severe skin conditions. Owing to its potent and highly praised keratolytic properties, salicylic acid exfoliation is able to weaken bonds of the aged and hardened skin cells. FEATURES SALICYLIC ACID: Salicylic Acid is considered a keratolytic medication, which means that it's perfect for supreme exfoliation. Keratolytic medications cause softening and sloughing of the top layer of skin cells. Salicylic Acid also loosens and breaks apart desmosomes (attachments between cells in the outer layer of skin). This allows deeper penetration of the Urea contained in Bare 40 Plus Salicylic Acid. PROTECT AND HYDRATE YOUR SKIN: Urea 40 Plus combines Urea and 2% Salicylic Acid providing a deeply moisturizing and ex-foliating experience for your skin for complete hydration.